Amphawa is the second most popular floating market and you can arrive there within no more than an hour away from Bangkok. The vibe is mostly authentic, many markets are tourist but this one mainly attracts local tourism. The riverbank offers a long way of enjoyable activities as tasting of marine gastronomy, tours around the hidden temples and the most lovely homemade art. Along the waterfront walkways of Amphawa Canal rise a small tributary of the Mae Khlong River, where attractive and commercial life takes place. 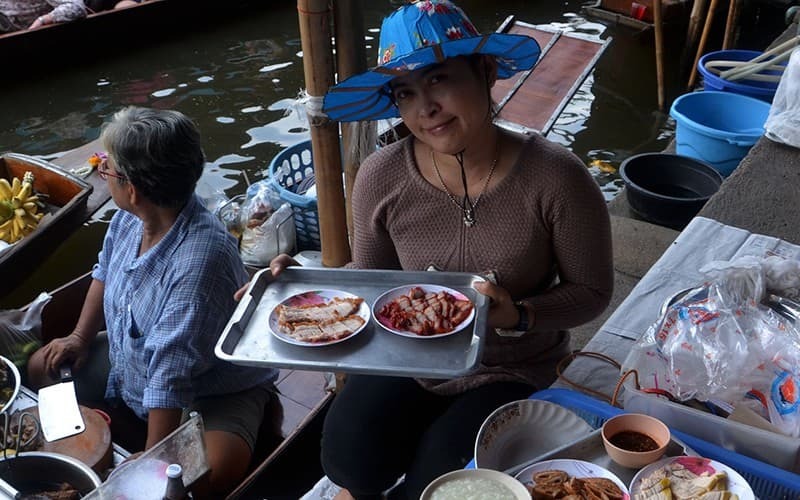 Every weekend local people come to the Floating Market, so big queues emerge along the canal's bridges and walkways. Even though it is a well developed commercial area, the wooden houses and shopfronts keep some of their original old charm, a delightfully traditional view. This scene was born in the Ayutthaya Period, when Amphawa was Khwaeng Bang Chang, a small community dedicated to agriculture and trade. Some people believe that a market has existed here since King Prasat Thong's mandate. On the other hand, in this town there is the Memorial Park in memory of King Rama II who was born here in 1766, his same mother's hometown and the place where his father was the ruler (more precisely Ratchaburi). Explore the canal sprawled with wooden boutiques, where Thai sellers offer a great variety of handmade products like clothes and paintings. Regional people produce sweets and toys too, that kind of items that you can't buy at other markets. Amphawa is famous because it doesn't disappoint any customer with its delicious and affordable meals, such as river prawns or grilled fish. Another traditional delicacy is the Squid for 100 baht, that shouldn't be skipped! Ride a boat to explore the multiple hidden temples, travelling around the wonderful views of the banks. The most gorgeous discovery is Wat Bang Koong, surrounded by a tree roots, with the Golden Buddha inside. This splendid temple is a must-see! Or you can visit the market along the banks with a boat, through which you will see locals selling snakes, seasonal fruits and souvenirs. Your professional guide will take you walk along canals and local shops, museums and handmade shops. After dinner, board a long-tailed boat along the river to explore bright fireflies. 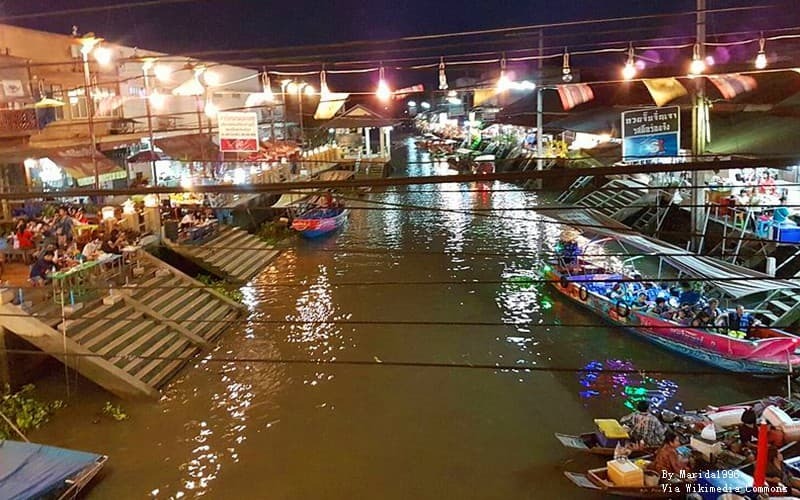 Amphawa is distinguishable from other markets because that opens until 8pm, allowing you to take a rest during the morning and keep an living spirit to sport the activities. Definitely this will allow you to have a good time, full of joy in this heritage port. 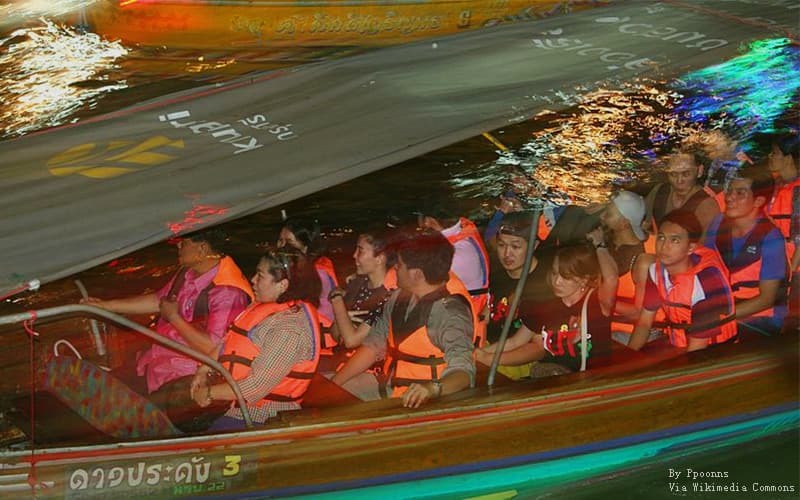 You can take a cruise to watch the Amphawa's famous fireflies, multiple lights surrounding tree tops. Amphawa Floating Market is open every weekend and official Thailand holidays, so you can rejoice eating and shopping from Friday to Sunday, from the noon till 9 pm. About mid-late afternoon it is getting full and more active. There is a train to Victoria Monument BTS Station that you can take from Bangkok. Once you arrive at exit 4, get down and walk to the minibus stop. Take it and continue to Amphawa Floating Market. The full trip takes a little bit more than 1 hour. There are several activities to keep kids entertained. There are all kind of toys to buy, many areas with a fair atmosphere and drawn-out candy shops. Children' favourite use to be the sticky rice with banana. As not everything is about shopping, a nice family trip on boat ride or the little ferry are available to enjoy. Bargaining is the Thai culture, so it is a must do it! Always check for different tours: the best of all is the fire-fly watching at night.